l have acquired a Pelican Grace Glider which l am trying to set up with a new Motor and Prop. My Tx is a JR DSX9 . 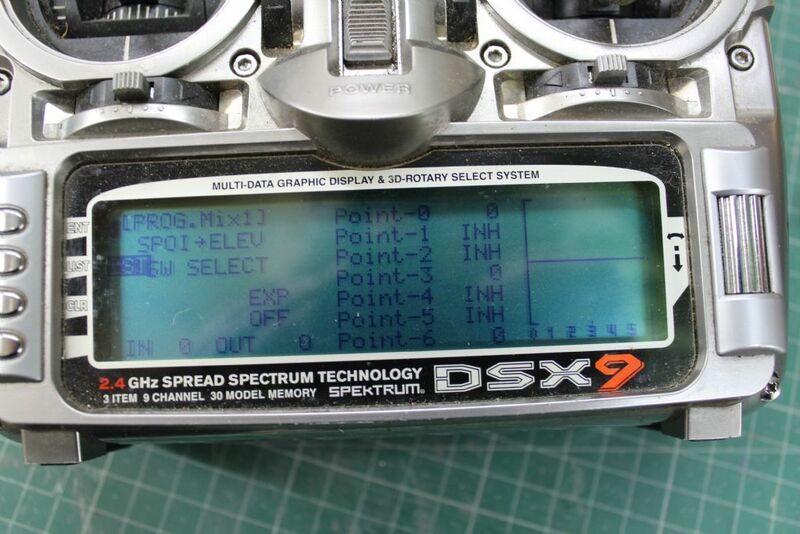 This only supports DSM2 so l am using Spectrum Rx which support both 2 & DSMX. The Glider supports 7 Channels 2x Ail, 2xFlap, Elev. Rudd. Motor. l am following the JR Inst. Manual for a 6 Chanel set up , ie for everything other than motor. The Esc is plugged into Aux2 for Motor and l have allocated this to left side flap lever on side of Tx. Apart from Flaps everything is working correctly including motor. 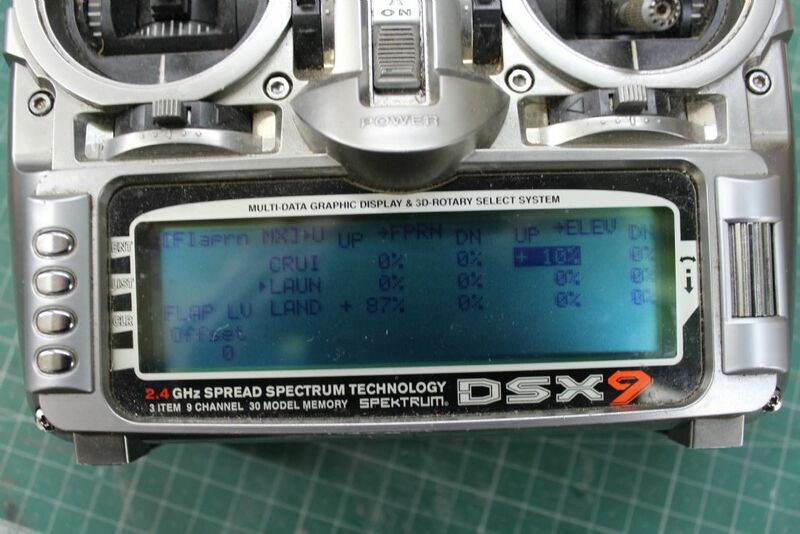 When l switch on the Flaps default to the full down position, about 80 degrees. The Flaps should operate on the Spoiler/Throttle stick but nothing happens. l have tried the Servo reverse on Flap on the menu but again nothing happens. Following the Menu and using Sub trim the Flaps will move but that is it. l have spent hours trying to get the Flaps to work on Spoiler but to no avail. If you follow the JR manual you will never get them to work, it is rubbish. Google a full house glider set up and you should find a guide as to how it should really be done, as I had to. No idea where my instructions are now but could guide you through it if you draw a blank. 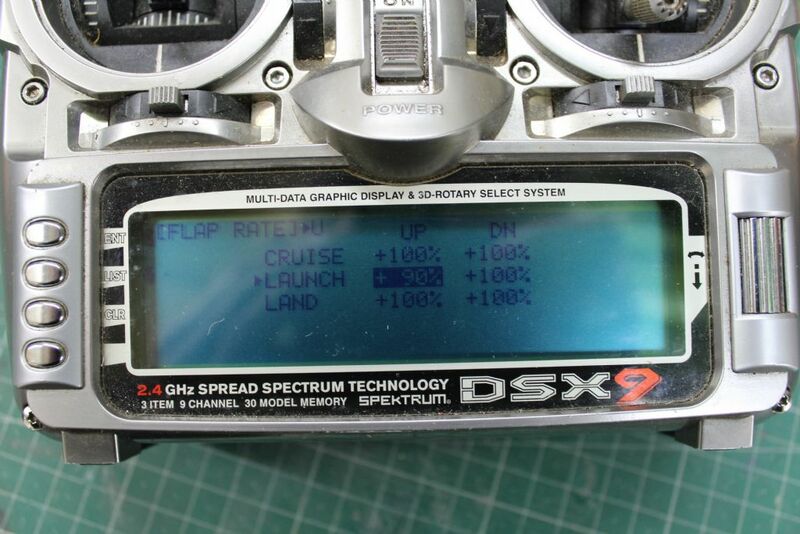 Mine uses a normal throttle stick and the mode switch for launch, normal flight and crow. Quite easy to use although it would be nice to be able to disable the throttle then use the stick for variable crow braking. The problem might be in the 'DeviceSEL menu. 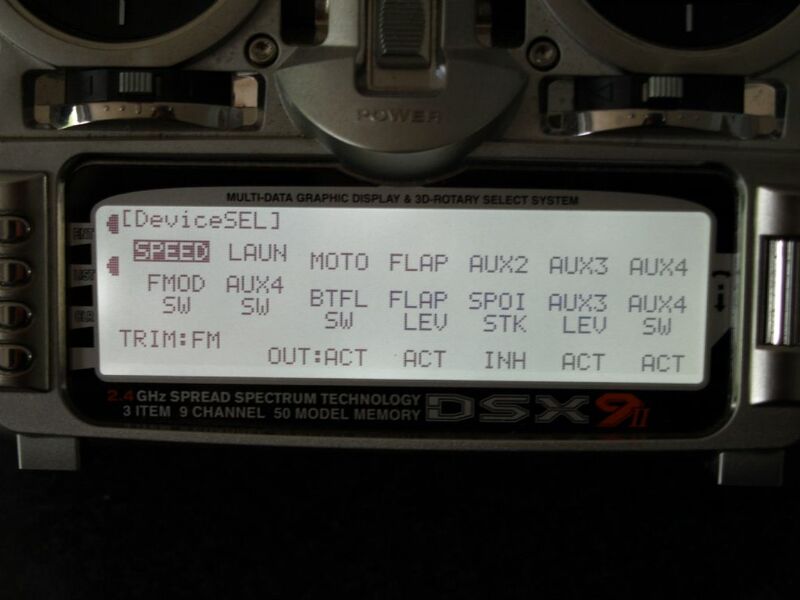 This is my menu for an F5J glider, I have the motor on a switch only (labelled T.hold.Mix on theTx), crow braking enabled in all flight modes on the left stick (Mode 2). I have other mixes in there but they are just elevator compensation, ailerons up for crow and snap flap (elevator/flap mix). 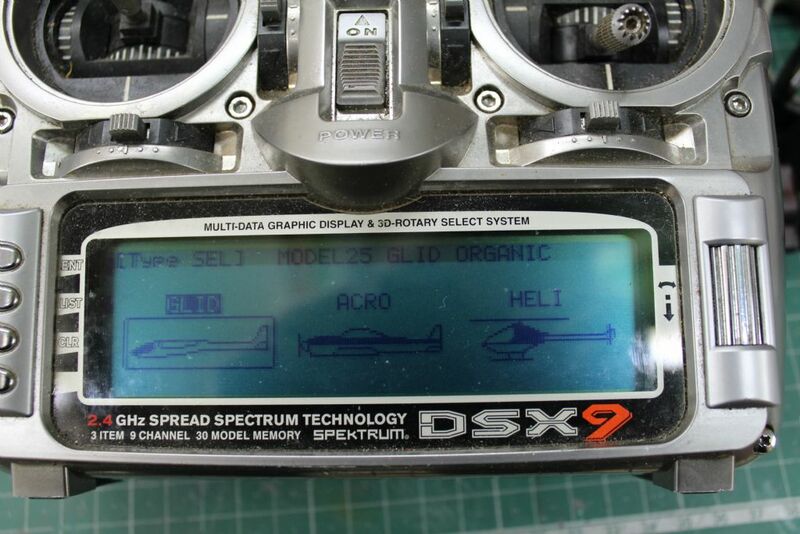 I moved to a DSX12 which has the same wacky glider channel assignments, it can do a six servo wing but it's mighty awkward. I gave up and moved to Jeti where you tell the transmitter what channel you want things on. Many thanks for replies. I am not that bothered, at the moment , to have all singing and dancing Mixes for launch ,speed and land etc Quite happy with the basics of simple flap operation, maybe mixed with elevator, for landing. l copied your set up int my Tx. As mentioned in first Post l have esc into Aux2 and my assigned switch is Aux3lever. I have Aux3,4,5 free so could use any of those if necessary to power the electric motor, if l need Aux2 free. Why not Left Flap, and Right Flap in Aux 1 on a Y lead, as both surfaces go up or down at the same time to operarate. 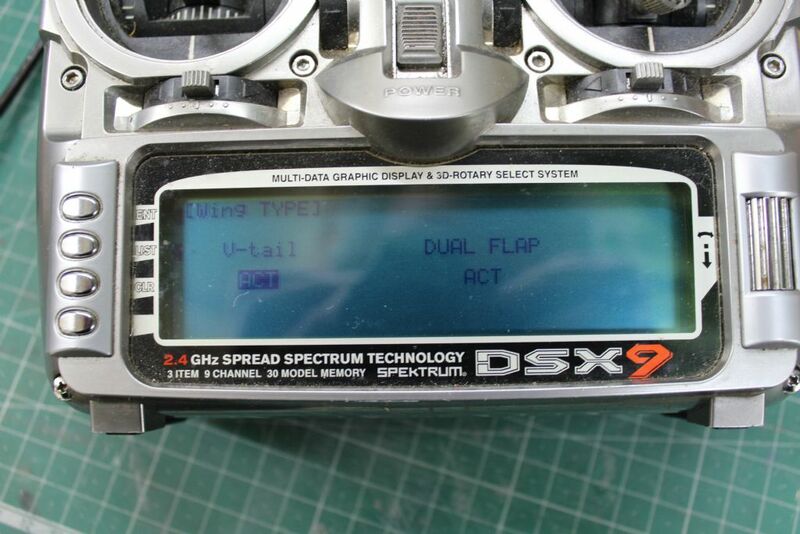 Installing flaps initially has servos fitted that each drives the same way. 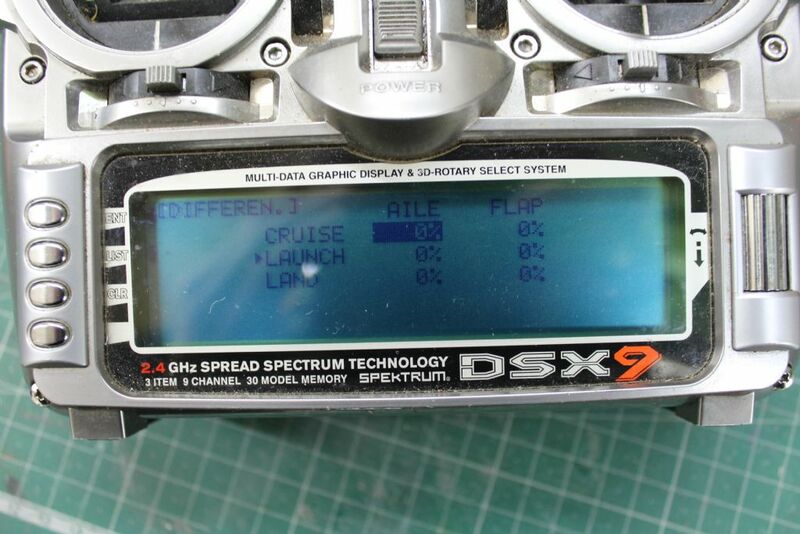 You need the settings for your DSX9, nothing else. As I said above, just google it. Geoff I also struggled to get a satisfactory setup with a DSX9, like Gary I also tried with a DSX12 but in the end admitted defeat & moved to Jeti. 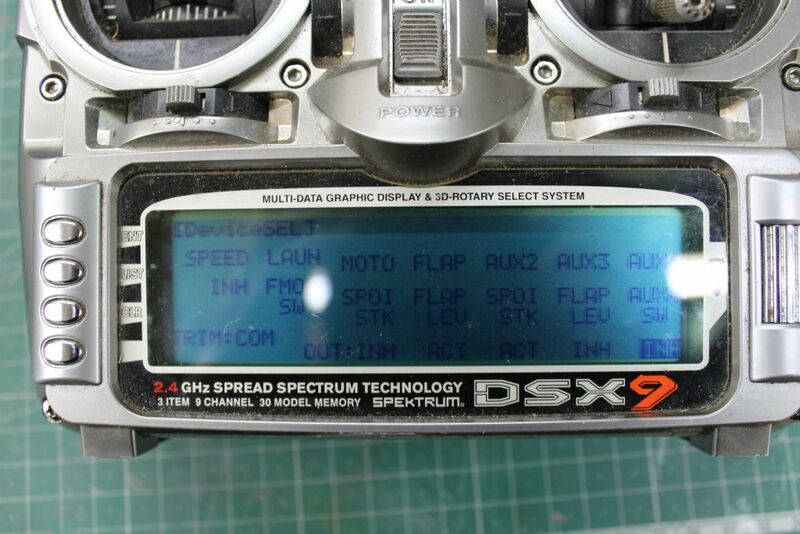 That said I did find it much easier with a Spektrum DX9 than the JR DSX9, software rapidly developed soon after JR's DSM2 radios came to market. 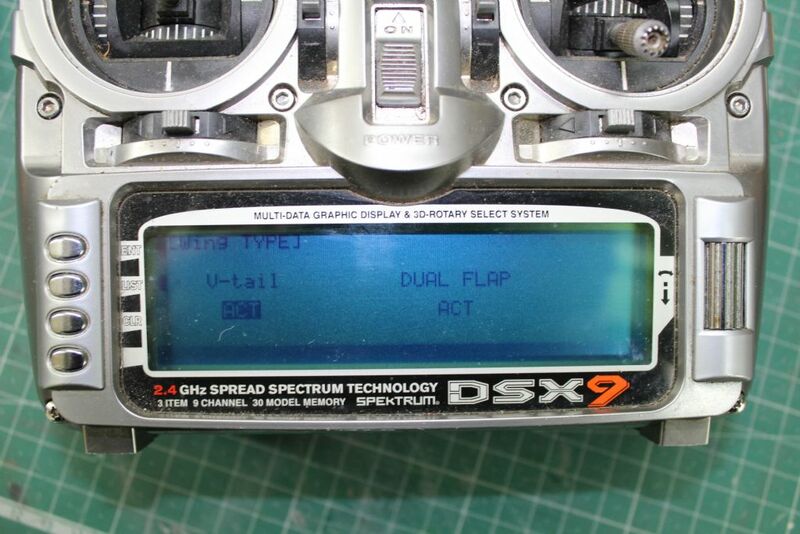 However I was more or less able to get a limited glider setup working on the DSX9 with the help of the DVD 'Radio Clinic for Sailplanes' produced around 2008 for the JR XP9303 which has the same programming as the DSX9. If you PM me your address I'll send you the DVD with my compliments, its 1hour 50mins may well help clarify some of the many quirks in the software. Hi John. Sorry to be stupid but what is PM my Address and how do l do it !樂. Thank you for your interest and offer. I'm afraid all my electro gliders are on Jeti now but I'm fairly sure the channel assignment was by the JR manual. I know at one stage I used the Aux 4 port but can't remember why, I also had an intermittent right flap problem (sometimes it moved, other times it froze), spent ages looking at the wiring but in the end it was down to a conflicting mix. 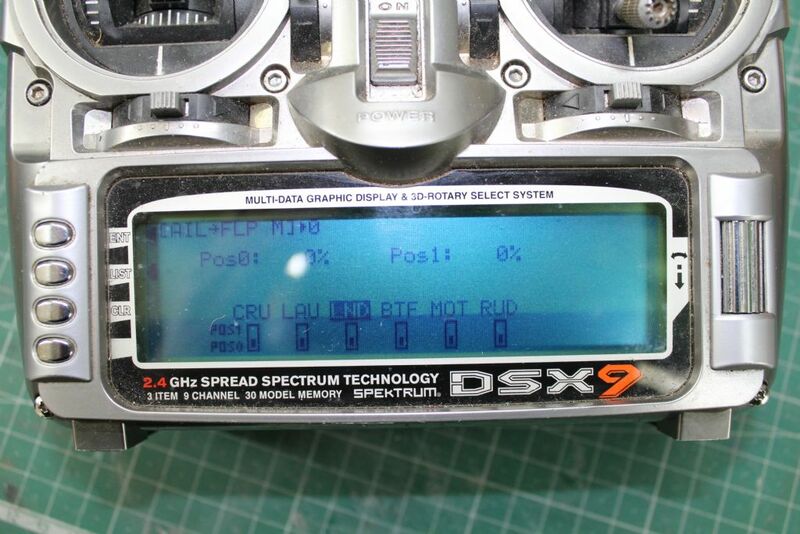 There is a function on the DSX9 (and others) which changes the throttle stick control between throttle and crow brake depending on the flight mode, I think it's called 'moto hold' but I never dabbled with that. On Y leads, the higher performance gliders can have their flaps move up (reflex) for a high speed/low drag aerofoil. This handily also means that the flaps can work opposite each other for extra roll control, in that case the flaps can't easily share a channel. The independent sub trim function for each flap would be lost though mechanical adjustment would still be available through the pushrod clevis. Geoff, PM = send me a Private Message (so as not to reveal your address to the whole world). Just click on my name in this post & scroll down, you will see an option "Send me a message" and click on that. Your message will be sent to my inbox on this site & I will also get an email from model flying.co.uk telling me that the message is waiting for me. I can then reply via the site or if you include your email address in the message I can respond directly. I'll send you a PM now with this info copied & pasted. Hi Martin, thanks for input. Just working my way through the various suggested options. 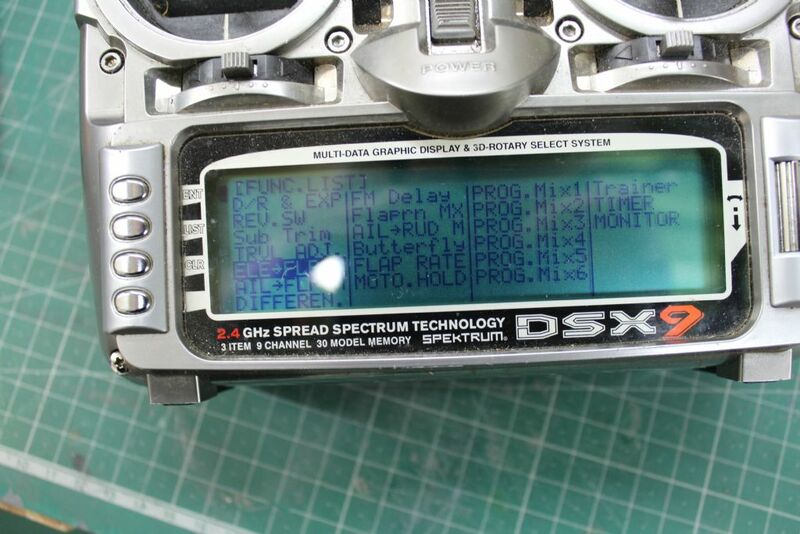 Pretty Happy my Rx set up ,as set out in original Blog ,is good.This seems to be the same for the Spectrum DX Rx’s which makes sense since we both operate on Spectrum technology. method is very different ,so l cannot follow that program method. The more modern DX system looks so much easier to use !!! It seems obvious to me l am just missing one simple matter to get the Flaps working in the Tx set up but at the moment l still cannot find it. Then look at the Monitor screen. Move the throttle stick & I think you will find that it operates Aux2 output. As you have allocated Aux2 to the left lever in your model setup that overrides the throttle stick which is left with nothing to do, hence no flaps. I think you will need to go back & allocate the left lever to Aux 3, 4 or 5 & use that as the motor control, freeing up Aux 2 for the throttle stick/flaps. I don't think you can just reallocate the throttle stick on the JR DSX software. Hope that helps, it's from memory as I no longer have my DSX9 so apologies if I've got it wrong. The DVD is on its way to you. Hi Geoff, I have tried to photograph the relevant bits from my DSX9 but the Mk1 having no backlight made it difficult. This is for my Organic which uses a single central flap servo and a V tail but these bits are easily changed. Watch out for the left hand lever since it will operate flaps and cannot be disabled. Sorry, a couple are duplicated but could not get rid of them. Just to bring this blog to a conclusion. Many many thanks to all who responded. l have certainly learnt a lot about programming following all the links.! A particular thanks to John Lee for the video which is very informative. The prize however goes to Flyin Brian who sent me a link for a set up. it was an easy written Instruction sheet dealing with a full 7 house Glider set up for the JR. and best of all .......it works . Geoff , A happy Glider boy and looking foreword to maiden flight. Best of luck with the maiden, glad that we were of help. Does anyone know who manufactured the Pelican Grace 2.7m Glider. l have done a Cof G Calc, which comes out at 62 mm from LE on a cord of 230 mm, so about 27%. Will need a fair bit of Pb to balance so just wondering if anyone has this Glider, and could tell me the Manufacturer figure for C of G.
Otherwise would you more experienced Glider Guys think 27% about right. Glad you got the radio sorted Geoff. The manufacturer of the Grace was RCM Pelikán in the Czech Republic. I think it may be worth starting a new thread in the Gliding section with the model name in the title, as this thread is indexed under 'Spektrum' many glider guiders will pass it by.